Requirement: Ensuring that samples are processed correctly and efficiently, and that correct antibodies are used when working with cell analyzers. Project: Reliable integrated 2D barcode reading solution for autolabeling of samples and barcode detection of antibodies for an integrated solution. Solution: Quadrus® MINI imagers from Microscan integrated with a frame in Miltenyi Biotec MACSQuant Analyzers, configured using the ESP®(Easy Setup Program) software. The setup of the test algorithm is automated based on the code on the reagent. Result: Streamlined laboratory processes, timesaving and minimized human errors, resulting in improved quality and efficiency. Miltenyi Biotec is committed to providing pioneering products to their customers. By integrating research, development and manufacturing processes, Miltenyi Biotec has a unique understanding of all procedures involved in the provision of high quality analyzers. The company uses 2D barcode readers from Microscan in their MACSQuant® Analyzers to streamline their customers’ laboratory workflow, ensure quality and minimize human errors. Since pioneering MACS magnetic cell separation technology in 1990, Miltenyi Biotec has grown into a vibrant, multinational team of more than 1200 biomedical scientists, physicians, engineers, and support groups. The company develops and manufactures a portfolio of products ranging from unique cell labeling reagents, through sophisticated cell separation and analysis devices, to innovative systems for clinical applications. Their goal is to advance biomedical research and cellular therapy by developing technologies that have an impact on basic research and clinical applications. Miltenyi Biotec’s MACS Solutions portfolio of outstanding tools addresses techniques of sample preparation, cell separation and analysis, molecular analysis, cell culture, and therapeutic plasma apheresis. The MACSQuant Analyzer provides best-in-class flow cytometry to researchers working in a wide range of fields: from molecular interactions, pharmacokinetics, and cell biology to systems biology, marine biology and biophysics. When the MACSQuant Analyzer was developed, Miltenyi Cell analyzers with 2D barcode readers help streamline laboratory workflow, ensure quality and minimize human errors Biotec needed to integrate a 2D imager inside the device to make it easy to use and to further ensure the reliability of the solution by reducing the chance of human errors. The fixed 2D barcode reader was implemented to assist researchers achieve seamless single and multisample processing with autolabeling through detecting the bottles of antibodies used during the analysis. The bottles are marked with a Data Matrix code, which contains information such as the sample number. The MACSQuant Analyzer can be set up in confined laboratory spaces, even in regular laminar flow cabinets. Scanning is carried out through a 4x3cm window in the analyzer. The right scanner for the job had to be able to read codes reliably and without errors when the bottles would be positioned manually in front of the window, in any orientation. 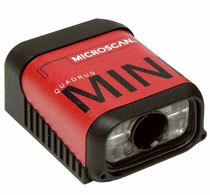 Miltenyi Biotec selected the Quadrus® MINI imager from Microscan for the MACSQuant Analyzers. The 1.3 megapixel imager reads all standard 2D or linear barcodes, and can also decode multiple codes per capture. Dynamic real time autofocus automatically reads different codes, at varying distances, while in motion. The Quadrus MINI can read symbols as large as 50.8 mm square as close as 25.4 mm, and the imager includes user-friendly features such as visible performance indicators, ESP® (Easy Setup Program) software, and one touch setup and configuration. The Quadrus MINI’s small form factor allows for flexible positioning in tight spaces. These features make the Quadrus MINI ideal for built-in solutions such as the MACSQuant Analyzer. The multisample processing with autolabeling begins when the user scans the reagent bottles using the barcode reader. The MACSQuantify Software automatically identifies the correct staining protocols and minimizes user error. Then the reagents and samples can be placed onto the MACS MiniSampler, and the user selects the desired analysis and presses start to process up to 96 samples in a single run. Labeling is fully automated using correct incubation times and titers (e.g., PI, 7AAD, and antibody staining), and the entire process is streamlined, delivering walk-away flow cytometric analysis. Autolabeling of samples and barcode detection of MACS Antibodies using the Quadrus MINI help streamline and optimize the workflow in laboratories. Handling is made extremely easy and this saves the researchers valuable time. The built-in solution increases efficiency, and minimizes the chance of errors. In addition to its small size, the Quadrus MINI is easy to integrate using the ESP Software to customer-specific settings, and can be offered as a plug-and-play solution from Miltenyi. The Quadrus MINI is ideal for built-in solutions thanks to its small size and user-friendly features such as visible performance indicators. Multisample processing with autolabeling begins when the user scans the reagent bottles using the barcode reader.